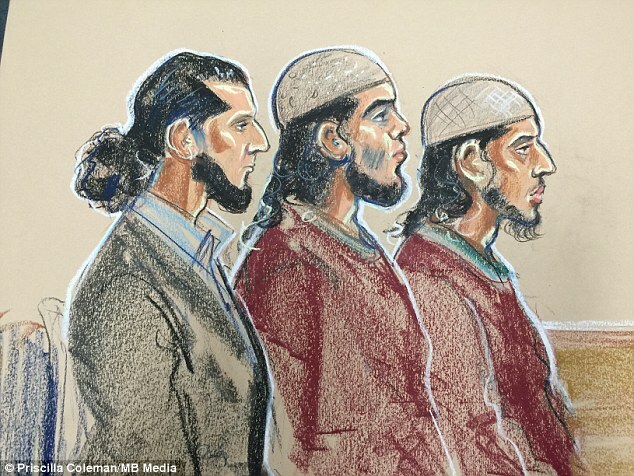 Three alleged jihadists who are accused of plotting a Remembrance Day beheading in the name of ISIS stamped on a charity poppy just days before the planned attack, a court has heard. The trio were obsessed with the murder of soldier Lee Rigby and wanted to bring fresh bloodshed to the streets of Britain on Remembrance Sunday last year, it is alleged. British nationals Nadir Syed, 22, and Yousaf Syed, 20, who are cousins, as well as Pakistani Haseeb Hamayoon, 28, are all charged with preparing terrorist acts. Today jurors were shown video footage filmed on Yousaf Syed's mobile phone which shows him and cousin Nadir crushing and stamping on a commemorative poppy on the street. 3 lamp-posts... 3 ropes Instant Justice. And I'd happily pull on their legs. ALLAKAKA wrote: And I'd happily pull on their legs. Will ' Dave ' be telling the CPS to drop this case against the 3 defendants on the grounds a prosecution would deemed a 'Hate crime '.